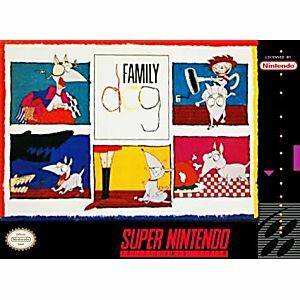 Family Dog SNES Super Nintendo Game Cartridge Cleaned Tested and Guaranteed to Work! A CANINE COMIC ADVENTURE! Take a wild look at American life through the eyes of the Family Dog. 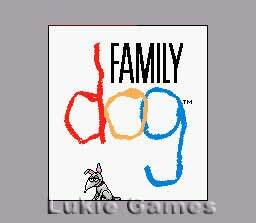 Dodge the mischievous antics of the prankster son as he teaches the little pup new tricks. "Play Dead" has a whole new meaning as the youth bombards pooch with tennis balls and chases after him with a high powered vacuum cleaner. Just when the hound thinks it's safe - it's off to Obedience school. Here he is surrounded by overly enthusiastic instructors and their very hungry Doberman pinschers. His goal is to escape the compound and make it back to his "loving" family. Dash across the heavily guarded fortress, bound through the limbs of a dark forest and let out powerful barks to ward off creepy creatures. Make it through the cliff-hanging challenges and prove you're the top dog! 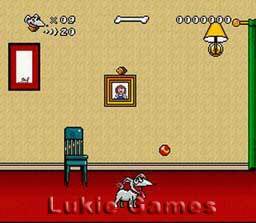 If you liked this game as a kid, you'll still like it now! 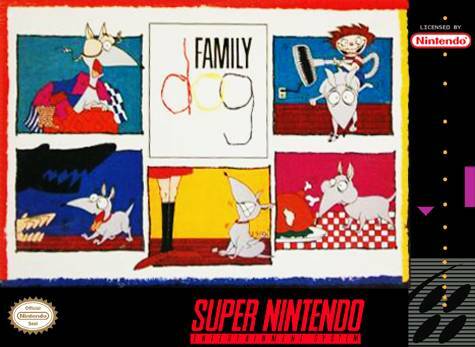 An excellent, and extremely unheard of game. It may not be the best game out there because of the lack of a good soundtrack or storyline. But those are still in there and its still very enjoyable.